Hi there! Our names are Stephanie Campbell and Ashley Lutz and we are seniors at Summit High School in Bend, Oregon. For our senior year, everyone in our class is choosing a project that positively impacts a community over the course of the year and in May, we will give a Ted Talk-style presentation to our class explaining what we accomplished with our project. We decided we wanted to do a project that not only impacted a community, but we also wanted to help bring awareness to our cause. 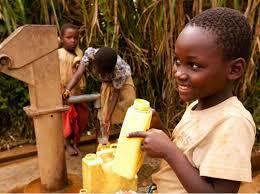 For our project, we decided we wanted to help raise money to build wells for clean water access in Kenya. So many of us in the United States have easy access to clean water that it can be difficult to imagine having to walk miles from your village to find water, which often times is not even clean and safe to drink. By raising money, we are funding a project in Kenya to build a well right inside a village that allows easy access to clean water. By donating money to our fund you are helping save lives by giving families the most basic thing all humans need: water. Our goal is to raise at least $5,000 by May, which funds a fairly simple well. The more money we raise, the more it will benefit the community. We need all the help we can get! Anything you can donate helps get us a step closer to that goal so please donate today and reach out to your friends and family to help make a difference in hundreds of people's lives. We are so thankful for your support and hope our project can help inspire other people to start similar projects so that one day, no one is deprived of clean water. Please check out this video:https://m.youtube.com/watch?v=PZ6J3hUo0kE created by The Water Project to better understand the impact that donating money for building wells has. Thank you! 12/09/15 Judy Smith $68.00 Great project! We wish you much success!